life seems covered by darkness? ”He will cover you with His feathers, and under His wings you will find refuge; His faithfulness will be your shield and rampart” (Psalm 91:4). “Joy runs deeper than despair.” These are the words of Corrie ten Boom. Cornelia “Corrie” ten Boom was a Dutch Christian who, along with her father and other family members, helped many Jews escape the Nazi Holocaust during World War II, eventually being imprisoned for it in a concentration camp. Her most famous book, The Hiding Place describes the ordeal. Ultimately, Corrie’s enemy was not the German soldiers she faced while being held prisoner. It was despair, hopelessness. So she looked to her Savior and His joy ran deeper than her despair. Our enemy is not our illness–it is the despair that leads to hopelessness because of it. 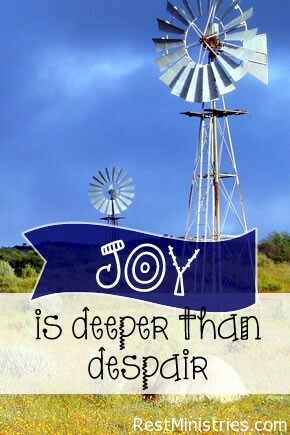 Yet our joy can run deeper than our despair. I was treated for clinical depression in 1994. I reached a point where despair was my enemy, and my enemy at that time was winning. It was the intervention of my God, my husband, and a godly counselor that pulled me out of that despair and brought me back on the road to recovery and hope. God intervened during one of my counseling sessions. He allowed me to see His arm reaching down to me as I was praying to Him. Before, I was deceived into believing that God had turned His back on me, therefore despair and hopelessness had followed. I could not reach out to Him, so He reached out to me. His joy ran deeper than my despair. Amazing. We can’t escape the darkness by running from His light, instead we will find our refuge and our shelter underneath it. Prayer: Father, I thank You that if we are a child of Yours, that when we are in the dark, it is because we are covered by Your wings. In the dark times, help us to remember and to trust in Your love and in Your faithfulness. Help us also to remember that when we can’t reach up to You, You reach down to us and we find refuge because You are bigger than our despair. In Jesus Name, Amen. Kay Davis lives in Fort Worth, Texas with her husband Ron. They have three awesome daughters and sons-in-law who have blessed them beyond measure with their eight precious grandchildren. For more of Kay’s writings you may visit her blog http://singingbirdcage.blogspot.com that is titled Songbird. 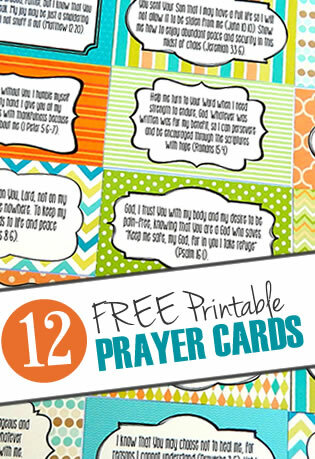 She finds solace in writing and prays that God uses it to draw others to Himself. Would you like to share a time when God broke through your despair and showed you His joy in its place? Filed Under: Devotionals, Grief, Joy, Loneliness, What's New? I love this. Thank you, Kay, for reminding me of Corrie’s story. Such an example of deep faith in Jesus. I especially love the wings quote. I will try to remember that when it’s dark, I’m safely nestled under His wings of love. Trudy, thank you for your kind words. Corrie is such an inspiration! It is a beautiful thought to be safe beneath His wings of love, isn’t it?!?! Kay, thank you for sharing your story and Corrie’s too. You both have a beautiful testimony. There are so many who suffer with depression, including me. May the Lord use you to encourage a lot, to let them know there is hope. I think one of the toughest parts of this mental condition is feeling like it will never end. You and I have both had the experience of relief. .
Like Trudy I love the quote about it being dark when we’re covered by the Lord’s wings. Isn’t it great to have grandkids? We have just two, who live a long ways away, but what a joy they are!! I’ve saved both of those special quotes in my file of great faith quotes. I just sent the 2nd quote to a friend of mine going through a tough time. It’s a wonderful image & so very comforting. So good to hear from you again, Kerryn!